The Liberal Redskins still haven’t won two games in a row. Friday night in the Big House the struggling Great Bend Panthers beat Liberal 53-43. Great Bend was playing without two players who were sick. The Redskins were 1-17 from three point range and shot 30 percent from the field in the loss. The Skins led 15-9 after one quarter and led 22-19 at halftime. However, Liberal missed many open shots which would have allowed them to be up by double digits at the half. The Redskins played a woeful third quarter as the Panthers outscored the Skins 15-6. Great Bend led 38-28 with 5:20 to play and 42-32 with 3:12 to go. LHS cut the lead to five at 44-39 with 1:54 to play. Tristen Bigham had 12 in the loss and Cameron Riley and Kace Vongsakda had 10 a piece. Liberal is 5-9 and 0-4 in the WAC. Great Bend is 3-11 and 1-3 in the WAC. 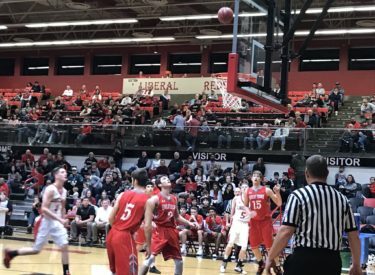 It’s Great Bend’s first win in Liberal since a triple overtime win in 2011. Liberal had won 11-12 in the series since then. It’s Great Bend’s first win over Liberal since 2014 when the Panthers beat the Redskins 47-40 in Great Bend. The Redskins host Guymon Tuesday night at about 7:45 on 1270 and kscbnews.net.